FORT LAUDERDALE, Fla. – While no one expected the U.S. Catholic bishops to use the beachfront hotel meeting site for their bi-annual meeting as a time for sunbathing and relaxation, few had predicted that this week’s gathering would gain such national attention. But when Cardinal Daniel DiNardo, head of the United States Conference of Catholic Bishops (USCCB), kicked off the first session with a strong rebuke to Attorney General Jeff Sessions’ decision not to allow women fleeing domestic violence to seek asylum in the United States, much of the country took notice. Yet, while the meeting began with a unified commitment among the bishops that they must serve as a prophetic voice in resisting the Trump administration’s immigration policies, a different tone swept over the meeting when they heard from the voices of young people. In preparation for the October Synod of Bishops from around the world to discuss young people, faith, and vocational discernment, there was widespread recognition that rather than speaking, in order to better understand the needs of the future Church, they must begin with a posture of listening. 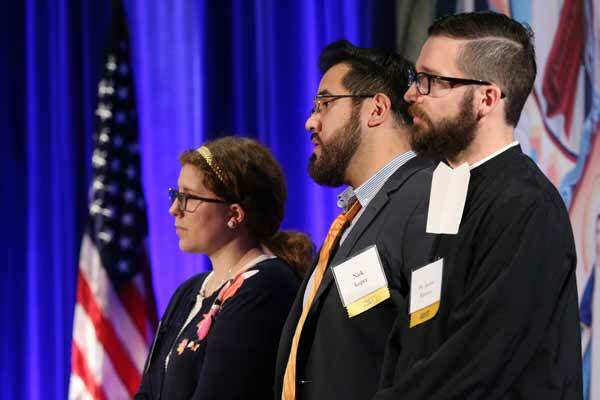 Since the November 2016 election, immigration has become the defining issue for the U.S. bishops and support for finding a permanent solution for young undocumented immigrants who were brought the U.S. as minors has brought significant unity among members of the Conference. While a DACA solution has been and will remain the priority for the USCCB, the administration’s recent policy of family separation – denounced by Cardinal DiNardo on Tuesday as “immoral” – has injected new momentum, and anger, among bishops over the current treatment of migrants. In a vigorous discussion on Tuesday, Cardinal Joseph Tobin of Newark, N.J., recommended that the U.S. Bishops lead a delegation to the U.S.-Mexico border to inspect the conditions of migrant detention facilities and as a visible sign of solidarity with migrants and refugees. Soon thereafter, Cardinal DiNardo announced that the conference would look into such an initiative. In interviews following the announcement, multiple bishops told The Tablet that they were convinced that the delegation would take place. During the discussion on immigration, multiple bishops insisted that immigration must be treated as a “life issue,” leading Bishop Edward Weisenburger of Tucson, Ariz., to suggest that the bishops should consider “canonical penalties” for Catholics who oppose immigration reform efforts. Bishop Oscar Cantú of the diocese of Las Cruces, New Mexico, spoke of the success of prayer vigils in front of abortion clinics in his dioceses that recently led to the closing of one facility. “Visible gestures go a long way,” he said – adding that it was perhaps time that bishops consider prayer vigils in front of Federal Courthouses over immigration policy. And in an intervention that spoke to the complexity of the Catholic population in the United States, Bishop John Stowe of Lexington, Ky., said that the bishops could not neglect the fact that many Catholics work for detention agencies and as border enforcement agents, and that the bishops must provide pastoral support for them, especially as they may seek the need to conscientiously object from deportation orders. Following a proposal to draft a short letter “to inspire prayer and action regarding public life” and a video that would complement rather than revise the latest version of “Faithful Citizenship,” numerous bishops expressed concern that the current source document fails to adequately reflect the teachings of Pope Francis on issues related to poverty, immigration, and climate change, among others. Others, such as Bishop Nicholas DiMarzio of Brooklyn, noted “Faithful Citizenship” was drafted to form consciences and today, consciences are “formed not by us but by the media” – and used the occasion to raise the fact that very few Catholic citizens will read lengthy documents and that the bishops should seek to utilize new media, particularly videos or podcasts, to reach Catholics via a different medium. In his opening remarks to the bishops, Apostolic Nuncio to the U.S., Archbishop Christophe Pierre, encouraged listening over talking, especially to young people, Hispanics, and Latinos, as the Church seeks to be attentive to the needs of those that will define its future. “Spiritual fatherhood and effective evangelization require listening,” said Archbishop Pierre, as he urged the bishops to give special priority the October Synod in Rome called by Pope Francis to address the needs of young people. Later that same day, the bishops turned over the floor to the three young people who represented the United States in Rome at a meeting this past March in preparation for the Synod: Brother Javier Hansen, who teaches at Cathedral High School in El Paso, Texas; Nick Lopez, director of campus ministry for the University of Dallas, Texas; and Katie Prejean-McGrady, a young mother and youth minister from the Diocese of Lake Charles, La. Prejean-McGrady said the preparatory document that came out the March meeting should be read as if the bishops were having a cup of coffee with a young person and seeking their honest answers and questions. Lopez said that Pope Francis specifically sought to hear from young people who have left the faith and that they were also invited to participate in the March gathering so that it would not be an echo chamber, but rather, an honest discussion of the realities facing both young people and the Church today. One consistent theme that emerged throughout the back and forth between the three young people and the bishops was the need for mentorship. Prejean-McGrady said that too often bishops are unsure how to relate to the young members of their congregation and that young people aren’t sure how to approach their bishops. “I’d be willing to bet that many of you in here have a Netflix account and a favorite show, that can be a great conversation starter,” Prejean-McGrady said. Archbishop Charles Chaput of Philadelphia, Pa., head of the Committee on Laity, Marriage, Family Life and Youth, noted that the outcome document of the Synod in October will likely lead to a new apostolic exhortation from Pope Francis and it will be the first magisterial document focused on youth and young adults – a sign of the importance of the Synod process and its conclusion. While the pre-Synod meeting last March and the theme of the Synod, in general, has been the subject of scrutiny and skepticism among some Catholics – Catholic commentator Raymond Arroyo memorably asked “Why are we listening to young people, who really haven’t experienced a lot of life, or God, frankly?” – Prejean-McGrady told The Tablet that she believed the response of the bishops this week was vindication of the involvement of young people in this process. 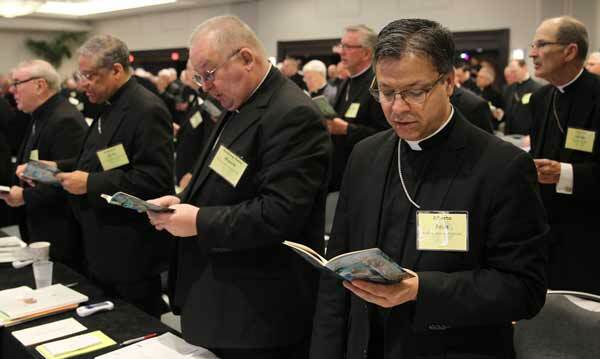 While the U.S. bishops will not meet again as a collective body until this coming November, nearly 100 of them are expected to gather in Gaylord, Texas, this coming September for the V Encuentro, a gathering of nearly 3,000 Catholics that will serve as the capstone of a four-year process of discernment and reflection on the U.S. Church’s Hispanic and Latino ministry. Between now and November, the bishops will also finalize its forthcoming pastoral letter on racism, which is on track for a vote at the November meeting, and follows the approval of a “pastoral response” document for Asian and Pacific Island Catholics during this week’s meeting in Florida – all of which could be described as signs that the U.S. bishops are spending much of their time focused on those on the peripheries or the margins of the Church rather than those at the center. 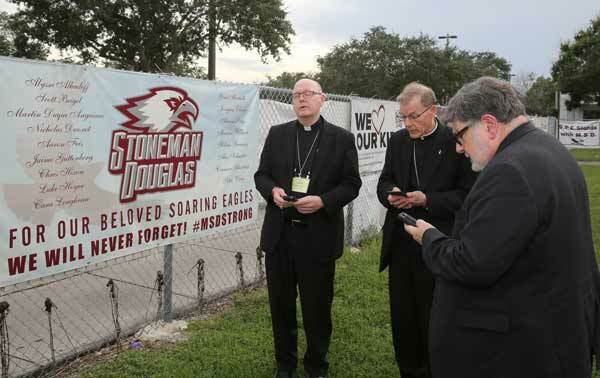 As the U.S. bishops debated how to best implement the teachings of Francis in their voting guidelines – revealing lingering tensions both over content and the medium of engagement – they moved immediately from that discussion to a luncheon with refugees, immigrants, and Temporary Protected Status (TPS) beneficiaries and some bishops then headed to visit nearby Marjory Stoneman Douglas High School in Parkland, Fla., the site of one of the country’s most recent scenes of gun violence, in what could be described as quintessentially Francis-styled gestures. How about penalties for politicians who vote pro-choice?